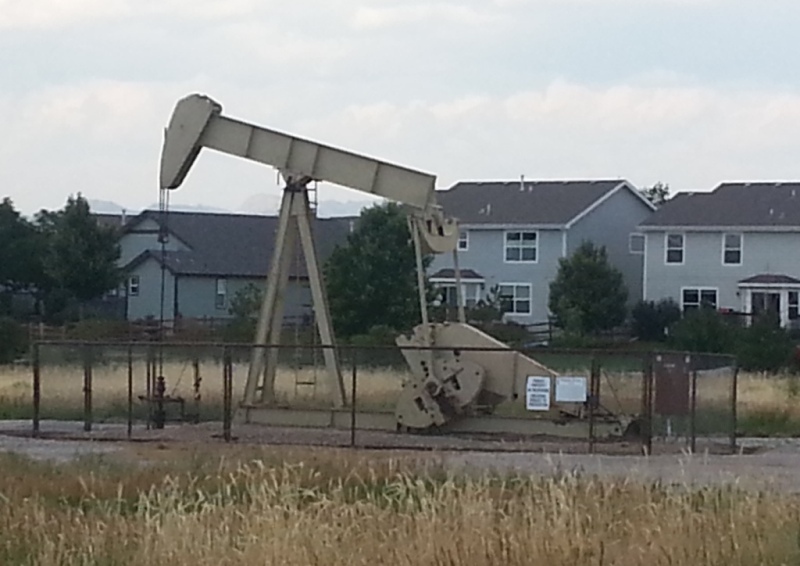 As oil and gas drilling are reaching all-time highs in Colorado, drilling is occurring closer to schools and residential neighborhoods, like this one in Fort Collins. Photo by David O. Williams. There’s still a glimmer of hope for Gov. John Hickenlooper’s administration that a compromise can be reached between grassroots activists, environmentalists, divided lawmakers and oil and gas industry representatives and that a bill can be forged to provide greater control over drilling practices for local governments. A compromise bill, which would require a special session of the Colorado Legislature, could potentially head off a slew of local-control citizen ballot initiatives, at least a few of which are likely to wind up being voted on statewide in November. Hickenlooper has steadfastly maintained that state law trumps local control when it comes to drilling policies such as setbacks from schools and homes. The state has sued cities that have imposed hydraulic fracturing bans, and Hickenlooper — a former oil and gas industry geologist — is clearly torn by the split-estate regulatory framework that allows for separate ownership of mineral rights beneath private property. But Boulder Democratic Congressman Jared Polis, whose own Front Range property was impacted by drilling, won’t back down on his deep-pocketed support of several of the local-control ballot initiatives. The failure of state legislators to craft a compromise bill in the waning days of the legislative session that ended Wednesday has Polis all the more determined to let the voters decide what some in the business community are dubbing a statewide fracking ban, even though such bans would be left up to individual towns and counties. “My constituents and all Coloradans simply want the freedom to live their version of the Colorado dream without interference,” Polis said in a press release Monday. “Unfortunately, the current law takes away our ability to choose what is best for our communities and families by forcing fracking to happen anywhere, anytime. A recent Politico story headlined “How fracking could break Colorado Democrats” airs their concerns that such measures will attract a flood of industry and Republican campaign dollars that could help defeat Democratic Gov. Hickenlooper and U.S. Sen. Mark Udall in November. Hickenlooper has been a strong proponent of the current system of state control over oil and gas drilling by the Colorado Oil Gas Conservation Commission (COGCC), arguing for the overall safety of hydraulic fracturing, which is a drilling process that injects water, sand and chemicals deep underground to fracture tight rock and sand formations to free up more oil and gas. The Colorado Oil and Gas Association, an industry trade group, was not directly involved in negotiations but encouraged its stakeholders to participate in the process. “Those discussions focused on harmonizing local and state authority in regards to energy production. It is of critical importance to people across this state to balance local communities’ ability to act to protect the health, safety and welfare of Colorado families while also creating a consistent and predictable regulatory framework that allows for responsible energy development. Campaign representatives for both Udall and his Republican opponent, U.S. Rep. Cory Gardner, did not respond to email requests for comment.